We’d love your help. Let us know what’s wrong with this preview of 360 Degrees Longitude by John Higham. Much more than a travel narrative 360 Degrees Longitude: One Family’s Journey Around the World is a glimpse at what it means to be a “global citizen”—a progressively changing view of the world as seen through the eyes of an American family of four. After more than a decade of planning, John Higham and his wife September bid their high-tech jobs and suburban lives good-bye, Much more than a travel narrative 360 Degrees Longitude: One Family’s Journey Around the World is a glimpse at what it means to be a “global citizen”—a progressively changing view of the world as seen through the eyes of an American family of four. After more than a decade of planning, John Higham and his wife September bid their high-tech jobs and suburban lives good-bye, packed up their home and set out with two children, ages eight and eleven, to travel around the world. In the course of the next 52 weeks they crossed 24 time zones, visited 28 countries and experienced a lifetime of adventures. Making their way across the world, the Highams discovered more than just different foods and cultures; they also learned such diverse things as a Chilean mall isn’t the best place to get your ears pierced, and that elephants appreciate flowers just as much as the next person. But most importantly, they learned about each other, and just how much a family can weather if they do it together. 360 Degrees Longitude employs Google’s wildly popular Google Earth as a compliment to the narrative. Using your computer you can spin the digital globe to join the adventure cycling through Europe, feeling the cold stare of a pride of lions in Africa, and breaking down in the Andes. Packed with photos, video and text, the online Google Earth companion adds a dimension not possible with mere paper and ink. Fly over the terrain of the Inca Trail or drill down to see the majesty of the Swiss Alps—without leaving the comfort of your chair. John Higham is an aerospace engineer with an expertise in satellites. He is also an avid traveler, frequently writing and lecturing on his own experience traversing the globe. The Highams live in the San Francisco Bay Area. Visit him online at www.360DegreesLongitude.com. To ask other readers questions about 360 Degrees Longitude, please sign up. Although it took me 3 months to trek my way through this book, it proved one of the best and most inspiring works I have ever read. I must admit, I was more than one time made supremely jealous of this amazing experience, vested on the kids particularly by their loving and incredibly future-minded parents. Instead of buying the children Wiis and movies, they bought them invaluable experiences on a scale only rarely achieved. I spent 5 months living abroad and have been wanting to return ever sin Although it took me 3 months to trek my way through this book, it proved one of the best and most inspiring works I have ever read. I must admit, I was more than one time made supremely jealous of this amazing experience, vested on the kids particularly by their loving and incredibly future-minded parents. Instead of buying the children Wiis and movies, they bought them invaluable experiences on a scale only rarely achieved. I spent 5 months living abroad and have been wanting to return ever since, but this story turned that want into a raging desire. I don't have the tech job, so it will take me longer to save, but I will travel again, now with some good tips both about specific places and about unspecific occurrences. The book does an effective job of getting across the lessons about people and cultures without trivializing or patronizing them. It's not an "Oh, how quaint and cute" tourist trip, but rather a deeply immersive and overwhelmingly packed glimpse into little seen parts of the world, many of which I very well may never get to see. The trip covers geographic wonders and historical horrors, vastly different cultures and places very similar to home, and activities and trips both successful and wildly disastrous. Until I can save up to do the same, I will use my small photographer's income to tour across our own country when I travel for work, using the Higham's story as a guide for investing in the local culture and spending both time and money wisely. This book is a must read for anyone interested in travel or other cultures, although you should probably be careful if you have a penchant for spontaneous traveling, as it will make you want to walk immediate out of your front door, regardless of the fact that you are still in your monkey pajamas. One thing you should probably know about me before I proceed with my review. I suffer from wanderlust, the travel bug, or whatever name you feel compelled to call it. If I could explore the world for the rest of my life, I'd be a happy camper. That being said, you can imagine how giddy I was when this book showed up in my mailbox. I immediately got the goosebumps like I do before I travel caused by that feeling of exploring the unknown and the thrill that there may be an adventure in your immedi One thing you should probably know about me before I proceed with my review. I suffer from wanderlust, the travel bug, or whatever name you feel compelled to call it. If I could explore the world for the rest of my life, I'd be a happy camper. That being said, you can imagine how giddy I was when this book showed up in my mailbox. I immediately got the goosebumps like I do before I travel caused by that feeling of exploring the unknown and the thrill that there may be an adventure in your immediate future. I started this book and within a page or so I already had one question. Can I join this family? I mean, for real, this family is kickass. They spend 10 years meticulously planning and saving up for this "World-the-Round trip" (and yes, that's World the Round) in which they will travel around the world for 52 weeks with their two children that are 8 and 11. That would be enough to make most parents break out in a sweat and bring them to their knees with anxiety. And did I mention that for a good chunk of this time they will be cycling via tandem bikes from London to Istanbul with children and luggage in tow? This decently thick travelogue is set up like an itinerary with excerpts of the family's personal journal entries placed in various parts of the stories. There are also added goodies that were included. The book is set up so that at different points you will come to a place where you an go on to Google Earth to visually be a part of their trip. You'll see pictures, videos, and additional text. I found myself checking out a few of them (and will probably check out more at some point) but found it a little distracting while reading to stop and get on my computer. And the likelihood of someone reading this all in front of a computer is pretty slim. Really cool feature to the book but the novelty wears off after awhile. Anyways, this book is exceptional. I mean it. The Higham family adventure is one of the best vacations I've had from the comfort of my plush little chair. John Higham carefully creates a scrapbooks of sorts as he balances recounting the sights and the scenery (and some interesting facts along the way!) with the family's personal thoughts and experiences as they face the unknown and explore some of the most beautiful places in the world. He touches delicately on the frustrations and annoyances in traveling with one's family (such as how two adults can have alone time??) and shares the joys of experiencing the world and growing together as a family. Alot of travelogues I've read drag in places but he really knows when not to linger on one country for too long and how to balance reflection, descriptions of people and scenery, and insights on history and culture. Whether he is describing eating ham sandwiches for months, the challenges of "luggage Tetris" or homeschooling kids on the road--be prepared to experience the good humor that the family maintains throughout. I'm not sure I could find the humor in French campgrounds with no toilet paper or being stranded in remote places. But somehow this family is able to face defeat, give it a swift blow to the groin and keep on pedaling through some of the biggest hurdles and trials that one could face whilst traveling. The best part about this book, for me, is that this family seems to be navigating by the same principle of travel that I believe in. Traveling is so much more than snapping photographs in front of historic sites and staying in posh hotels. True, those are all elements that can make a great trip, but traveling is really about the rich experiences with other cultures and viewing the world as one gigantic classroom. It's, as John Higham points out, "about discovering how people all over the world are similar, yet different in profoundly subtle ways, and how because of those very differences we were always able to find something to eat, something to wear, and somewhere to sleep." I really enjoyed this family travel memoir! I must admit I even stalled to prevent the inevitable end. Naturally, as the youngest member of a world traveling family myself, this was a very interesting story. I could relate in so many ways, especially Jordan’s Epiloge about going back home. Throughout this wonderful true story, I caught myself laughing out loud and saying things like, “Oh my gosh! !” “Oh no! !” and “That’s so true!” Loved the chapter about the elephant, could visualize the bridges I really enjoyed this family travel memoir! I must admit I even stalled to prevent the inevitable end. Naturally, as the youngest member of a world traveling family myself, this was a very interesting story. I could relate in so many ways, especially Jordan’s Epiloge about going back home. Throughout this wonderful true story, I caught myself laughing out loud and saying things like, “Oh my gosh! !” “Oh no! !” and “That’s so true!” Loved the chapter about the elephant, could visualize the bridges perfectly in chapter 17 and also chapter 19 was a LOL. Of course there are too many examples to name! You’ll just have to read it for yourself. The kids were such great sports throughout the whole story. It’s so great that they got to have this experience and now share so many unforgettable memories as a family. After all, family is forever! Definitely a fun, exciting story worth a read! I love the appendix in the back and also the google earth. This is a gutsy story of a family of four that takes a year off to travel around the world. Parents David and September carefully planned the trip over the span of ten years to make sure everything could be as organized, efficient and cost-effective as possible. They brought two tandem bikes with them so they could experience naturally and independently the countries they visited. They also were smart enough to arrange that their friends mail them new books at different destinations throughout t This is a gutsy story of a family of four that takes a year off to travel around the world. Parents David and September carefully planned the trip over the span of ten years to make sure everything could be as organized, efficient and cost-effective as possible. They brought two tandem bikes with them so they could experience naturally and independently the countries they visited. They also were smart enough to arrange that their friends mail them new books at different destinations throughout their journey. Everything they planned was carefully calculated. The entire trip actually only cost about $125,000. I don't know for sure, but I suspect the author made it back in book sales and corporate sponsorship. There are several advertisements throughout the book and I noticed he defended capitalism on more than one occasion. He can write whatever he wants, but the ads cheapened the reading experience for me. I also want to say that I noticed at least three typos in the book. It's not unusual to find one, but three? No big deal, but the typos cheapened the reading experience for me, too. Their adventure wasn't without danger. Eleven year old daughter broke her tibia during the first leg of their journey. Eight year old son experienced extreme weakness, dehydration and nausea while hiking the Andes Mountains. They had some scary currency issues and traveled in malaria zones and witnessed extreme poverty. In spite of all that, the family never once wished they were home. When they did return to suburbia, they immediately missed the sense of closeness and togetherness they came to expect over the year of traveling and sleeping in tight quarters. I love that so much. Never in a million years will Jesse and I plan a trip of this magnitude for our four kids. I simply don't have the courage. But this book taught me to be a better trip planner for the trips we do take and even inspired me to be a better, more aware reader. Surprisingly enough, even though the author (briefly) describes the beauty of the world (e.g. Switzerland, Costa Rica, South America, etc. ), the prose itself is flat. His writing style is guy-like and reads more like an advertisement-ridden blog than a book. But it is a book and I did learn from it and I did enjoy it therefore, like every book I read, I give this book five stars. This was a great little story of a family of four who takes a year off from their 'real lives' to travel the world. As I began to read this story, I was a little frustrated - maybe because I was trying to get something out of the book that I wasn't getting. Then, as I continued to read, I became more appreciative for the writing and the way the story is told. Upon completing the book, I got the most out of my reflections of the story as a whole. I am grateful to the writer for not overdoing the This was a great little story of a family of four who takes a year off from their 'real lives' to travel the world. As I began to read this story, I was a little frustrated - maybe because I was trying to get something out of the book that I wasn't getting. Then, as I continued to read, I became more appreciative for the writing and the way the story is told. Upon completing the book, I got the most out of my reflections of the story as a whole. I am grateful to the writer for not overdoing the descriptions of their experiences (i.e. including every little detail). I realized, in the end, that the most exciting aspect of their story is that for each family/person who would follow the same path, the story would turn out so differently. I smile at the thought of how it would turn out for my family if we did the same. I'm not sure to give this a three or a two star rating. There were some funny moments, but I found a lot of it was just we did this and then we did that. The writing was a bit clunky in parts. I couldn't also help but notice the American centric viewpoint at times. Still, I had to admire the parents for travelling with their children for a year and experiencing all the trials and tribulations on their journey. 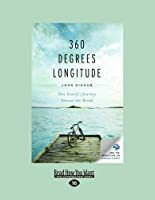 I’ve just finished reading 360 Degrees Longitude: One Family’s Journey Around the World, about the Higham family’s one-year travel journey. There was a brief moment at the start of the book where I didn’t think I was going to enjoy it. John Higham, his wife, September, and their two kids, Katrina (11) and Jordan (8) had been planning and saving for this trip for years. The family of four started out on tandem bikes: one parent on front, one kid peddling behind. 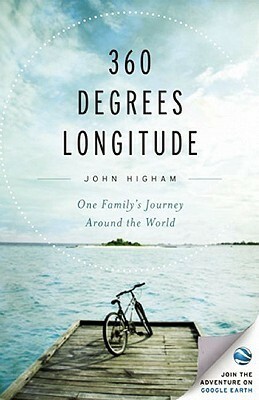 And while I absolutely admired them I’ve just finished reading 360 Degrees Longitude: One Family’s Journey Around the World, about the Higham family’s one-year travel journey. There was a brief moment at the start of the book where I didn’t think I was going to enjoy it. John Higham, his wife, September, and their two kids, Katrina (11) and Jordan (8) had been planning and saving for this trip for years. The family of four started out on tandem bikes: one parent on front, one kid peddling behind. And while I absolutely admired them for doing so, I quickly decided the book might not be for me. Cycling just doesn’t reel me in. But then without spoiling things for you, something happens and their travel plans were completely altered. The way they dealt with this showed such resilience and spirit of adventure. It was great to read. The book really shifted gears and their story made me laugh and cry and dream of travel. I enjoyed every minute of it, and read more slowly as the book progressed, in an effort to enjoy the experience for longer. I’ve read extensively within this genre. One of the major problems with many family travelogues is that the kids simply aren’t interesting. It’s the old problem of yes you think your kids are cute, but that doesn’t mean anyone else will. There’s a British family travel writer who comes to mind here—I can’t bear him raving about his children. They sound obnoxious. This was not the case in this book. John Higham has a great voice. He’s funny and thoughtful and honest. His wife September sounds amazing. His children are interesting and easy to like. Posted throughout the book are snippets from the kids’ travel journals, which make for an entertaining read. What I loved most about this great book is what I love most about long-term travel: there is an internal journey the traveller takes that is just as important as the geographical one. Higham doesn’t beat you over the head with this, but every member of the family grows and changes as a result of this journey they take. It’s a joy to read about. This is a wonderful, inspiring read. Considering how much I love traveling, I thought this book would be a run-away hit for me, but it was pretty middle of the road. Higham writes about taking his family of four on a year-long trip around the world. However, a lot of the book is really about odd bits of minutia and really seems to skim over or miss the really interesting parts of traveling. He made several clichéd statements about the “learning experience” in traveling that made me roll my eyes. Such as this statement about poverty Considering how much I love traveling, I thought this book would be a run-away hit for me, but it was pretty middle of the road. Higham writes about taking his family of four on a year-long trip around the world. However, a lot of the book is really about odd bits of minutia and really seems to skim over or miss the really interesting parts of traveling. He made several clichéd statements about the “learning experience” in traveling that made me roll my eyes. Such as this statement about poverty he made after visiting Tanzania, “I still don’t think handouts are the right answer. But neither is watching from the sidelines. Poverty is a complicated problem, with no easy solutions.” Whoa! Watch out for those deeply philosophical and original insights Higham, you might lose me. My personal annoyance with many small factors aside, this book did have some interesting bits and I’m glad I read it, but the writing was flawed and amateurish. I’m not sure I would recommend it to most people. what a fun read! I felt like I was there with the Highams as they chronicled their adventures all over the world. They sound like great people to hang out with :) It was enriching to learn about other culture tidbits and to see how the family dealt with various situations. John cracks me up with his thinking and how he appreciates his wife many times in different situations :) The kids have great attitudes and it was also fun to see how the humans all over the world can be alike yet different. I what a fun read! I felt like I was there with the Highams as they chronicled their adventures all over the world. They sound like great people to hang out with :) It was enriching to learn about other culture tidbits and to see how the family dealt with various situations. John cracks me up with his thinking and how he appreciates his wife many times in different situations :) The kids have great attitudes and it was also fun to see how the humans all over the world can be alike yet different. This title was on one of the goodreads ads so i followed the link. Very glad i did, love this book. They've been to places i've been as well as places i'm considering and places i am *so* not going. Haven't done the google links yet will check them out before i return the book to the library. it is more of a library book than an own book to me; the checklists and helpful hints might change my mind. The website and the google links mean i don't have to own this book. I just did a bit of exploring This title was on one of the goodreads ads so i followed the link. Very glad i did, love this book. They've been to places i've been as well as places i'm considering and places i am *so* not going. Haven't done the google links yet will check them out before i return the book to the library. it is more of a library book than an own book to me; the checklists and helpful hints might change my mind. The story of this family is simply amazing. Having traveled for a year with my family not long ago I connected with many feelings and perceptions they had, especially relating to other cultures and people. Interesting the way they start their trip comparing Americans to the other cultures, and by the end, they compare new experiences and local habits to things they lived and saw during their trip. They became global citizens. By the way, excellent book to plan a trip around the world! I LOVE this book. I felt like I was on the trip with the family. There was just enough funny, and just enough introspection. I was so sad to be going home when I got to the end. The best thing, though, is it's a book. I can travel around the world again, just by opening the front cover. Cannot recommend enough, especially if it is a dream of yours to travel around the world. The only thing bad about this book is that it had to end. Not just a travel story but a family-togetherness, weathering-hardships for adventure story. It's funny and interesting and so great. I was sad the journey had to come to an end. This book was very well written and I found I could not put it down. I was fascinated to find out how a family of four travelled around the world, and the end of the book provides a lot of useful information. I loved the humor in the writing as well. LOVED this book!!!!! It's about a family who traveled around the world in 1 year with their 2 children. Loved reading about their experiences and learning about places and customs. It made me want to book my trip, too! If you are at all interested in travel, check this out! Well-written! I thoroughly loved this book! I was even laughing out loud at times. This book makes Andy and I want to travel with the kids even more. There is so much in life to be learned be seeing how other people live. An added bonus is the quality family time. Absolutely loved this book. It was a quick read, but I learned a lot about the world. The only problem with this book is that it made me want to travel!! what an amazing journey and well-written book! loved it. i suspected they were LDS, although they never quite said so in the book--my uncle confirmed that he knows them and they are. "Things may be done differently here, but who's to say which is better?" I loved this book! Great travel writing - made me want to get to these places myself. This is a fun book about travel and family. John Higham, his wife, September, and their two kids, Katrina (11) and Jordan (8) travel together for one-year on a trip around the world! They plan and prepare for years and then take off for Iceland and beyond hoping to learn together about the world and life. They do a lot of planning beforehand, but are flexible and change plans as needed. They plan to start out biking from England to Turkey - a broken leg cuts a lot of that plan short, but they ke This is a fun book about travel and family. John Higham, his wife, September, and their two kids, Katrina (11) and Jordan (8) travel together for one-year on a trip around the world! They plan and prepare for years and then take off for Iceland and beyond hoping to learn together about the world and life. They do a lot of planning beforehand, but are flexible and change plans as needed. They plan to start out biking from England to Turkey - a broken leg cuts a lot of that plan short, but they keep going and have some neat experiences. It's fun to learn about the places they visit - from campgrounds in England to the hostels and valleys of Switzerland, the streets of the Czech Republic, then on to Turkey and Dubai, safaris in Tanzania, Japan, the Great Wall of China, Hong Kong, Thailand, temples in Cambodia, Panama, Bolivia, Peru and Belize. I loved reading about places I had visited and imaging how fun to be traveling there - I want to go back to Switzerland and I need to go to Cambodia and Machu Picchu. They visit some really wonderful places! It's amazing to think of exploring like this for a year, and all together as a family - what a neat way to learn! I don't know that that's the way I'd like to do it, but I think it's a really interesting idea and lots of fun! There are lots of how-to's included for people that want to try to plan a similar trip. I do like the idea of traveling together as a family and think it needs to happen more often. A theme of the book is that everyone they meet is a little bit different, but a lot the same. They meet many different people and learn first hand what life is like in many different places in the world. It was funny to hear of people in Switzerland wanting to live in Las Vegas. :) The writing is fun and a bit sarcastic, sharing a lot of the family dynamics while traveling together. There is also a blog and a Google Earth layer to follow with pictures and more stories. In Switzerland "the locals say that when it is raining, God is merely washing the mountains (p. 106)." "Jordan's Journal, September 24 - I played the Pompeii Pinecone Challenge. I kicked a pinecone, like a soccer ball, all the way through Pompeii. I had to make sure it didn't go over any fences, and I had to figure out a way to get it up the stairs...(p. 116)." Leaving for Turkey, John admits, "We were on this trip to get past the stereotypes and prejudices in order to 'know' and 'experience.' But talking the talk is one thing; it was not time to walk the walk. I looked at my children lost in their books int he predawn hours. I was envious. They didn't feel my anxiety, because they weren't encumbered by the stereotypes of my generation. I simply had to appear completely confident, even though I wasn't (p. 123)." "We spent the next hour or so discussing everything from AIDS to the meaning of life, corruption in governments, garbage collection services, and the vastness of space....I had naively thought that these philosophical discussions would occur almost daily on our trip...I had presumed our year together as a family would be spent learning about each other on a new level, debating politics, and discussing the wonders of science. What we found was that the days were filled with the trivialities of existence, just like at home. So, to be able to have a long meandering conversation with my kids under the starlight on an African night was worth the entire trip (p. 152)." "I learned something very important. Hakuna matata is more than a line out of a movie, and more than a casual greeting--it is a way of life (p. 166)." "Before I arrived in Lushoto, I would have described myself as a charitable person. But it was in Lushoto that I became a beggar, and the people of the town demonstrated a kind of charity that was frankly foreign to me. It took Lushoto to make me realize that what I lacked couldn't be purchased (p. 169)." "I marveled at [Katrina's] childlike faith [praying for her brother to get well so they could go to Disneyland in Hong Kong]...and wasn't that what the whole World-the-Round Trip was about? If September and I hadn't had childlike faith, we wouldn't have left California (p. 214)." "I love being in a new place and discovering what makes it tick (p. 248)!" "We learned a lot of valuable things we wouldn't necessarily carry in our suitcases, such as we can get by with a lot less stuff than I would have guessed a year earlier. We learned a tiny bit about what the world is like, but also learned that there is way more that we don't know than we do know (p. 336)." Such a cool family that embarked on an adventure of a lifetime. Interesting stories combined with just the right amount of facts and history and travel wisdom! Fun, descriptive, inspiring. I loved reading about how this family pulled together to get through difficulties, all the things that they learned and experienced along the way, and how wonderful and safe the world is on the whole. I love books about families that travel around the world. And while Americans are the least travelled people I know, it's always them who take their entire families on the road and then write about it later. Now is it that they take their families on the road more then most or are they the ones who just always have to cash in on a book later? I wonder. Anyway, I saw this book at Borders a few weeks ago and found it only at the LAPL system. It sat for 3 weeks and then when I couldn't renew it, I I love books about families that travel around the world. And while Americans are the least travelled people I know, it's always them who take their entire families on the road and then write about it later. Now is it that they take their families on the road more then most or are they the ones who just always have to cash in on a book later? I wonder. Anyway, I saw this book at Borders a few weeks ago and found it only at the LAPL system. It sat for 3 weeks and then when I couldn't renew it, I made an effort to read it in three days. And knowing the topic, I knew I could. And I did! Not all that surprising. Anyway, this is one of the better ones that I have read lately as this family wasn't in it for fame and while dad's that are obsessed with staying connected while on the road, that wasn't too main a point here. Plus, they wanted to cycle through Europe, which is always a nice twist. It didn't really work out as one of their kids had a major leg accident a few weeks in and like life, it didn't go as planned and things changed but the family rolled with it and kept on trekking, which was nice that they didn't dwell on it too much. They travelled around Europe, a bit in the Mid East and a touch on Africa. They travelled well around Asia and S. America to places that I have not been but definitely want to go and they made me want to go there more. These parents don't know how lucky they are with their kids. Don't know how much is true, but the kids hardly complained and a big part of their trip was reading. Now I think my sister and I are good kids, but I don't know if even we could have done something like this at that age. I could relate to a lot of some of the situations they used after coming back from my trip. You don't need so many possessions. Home is where your stuff is. Seems like you are always looking for water and a bathroom. All in all, a good read. If you are into books like this. I won this book as a GoodReads FirstRead giveaway. I sat on it for a while, as I had other books in the queue, but once I started reading this book, I was completely drawn in. It details the World-the-Round trip embarked upon by the Higham family - an amazing feat for a family of four, with two children, ages 8 and 11. This book, their trip, was incredible. I thoroughly enjoyed reading about their adventures and felt like I got to know their family a little. While reading it, I started to plan w I won this book as a GoodReads FirstRead giveaway. I sat on it for a while, as I had other books in the queue, but once I started reading this book, I was completely drawn in. It details the World-the-Round trip embarked upon by the Higham family - an amazing feat for a family of four, with two children, ages 8 and 11. While reading it, I started to plan who I will pass the book onto next, who I will recommend it to, and who I will send it to as a gift. I didn't access the Google Earth content as I was reading the book, but now I am going to go back and start from the beginning to look for all of those Google Earth icons. Page 209 - Chapter 15 - the description of John's return to Lamma Island and his attempts to find his hutong. I could feel his hysterics as he described running around lost and calling out his familys' names. And then the sheer bliss and flood of love for September when he saw the handmade arrows and signs she had set out for him. Love this. Page 267 - Chapter 21 - Jordan's journal entry from February 19 where he describes swimming for his life away from the "gigantic godzilla fish". I shared his moment of panic, and then laughed out loud when I read the last line of his entry - "...and I had to be too polite to save my own life." This was brilliant! I also chuckled to myself over the "Armageddon Pills" bit and love that the Higham's have raised such voracious little readers! After completing his graduate degree in aerospace engineering, John Higham moved to the San Francisco Bay Area where he started his career and accumulated ten U.S. patents for various aspects of satellite design. Although he arrived in the Bay Area single, it wasn't long before he met September and they became inseparable. John, September, and their two children, Katrina and Jordan, still live in After completing his graduate degree in aerospace engineering, John Higham moved to the San Francisco Bay Area where he started his career and accumulated ten U.S. patents for various aspects of satellite design. Although he arrived in the Bay Area single, it wasn't long before he met September and they became inseparable. John, September, and their two children, Katrina and Jordan, still live in the San Francisco Bay Area where John continues to design satellites to keep the mortgage current. “September was not deterred. “This is too cool!” she exclaimed. “How often do you get to go to a riot before church? Stand up straight,” she said quietly to the kids, “look confident and just act like you know what you’re doing.” She lifted up the police tape, dragged the kids under it, and started marching them across the overpass.